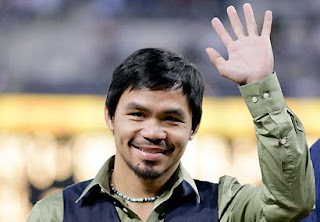 My Life and Activities here in KSA..: Pacquiao still no.1 as Pound for Pound King.. The Yahoo! Sports monthly rankings underwent big changes in October despite the fact that none of the top-ranked fighters were in action. Manny Pacquiao, who faces Miguel Cotto on Nov. 14 in Las Vegas in what is expected to be a high-paced bout, supplanted Floyd Mayweather Jr. for the top spot. Mayweather had a one-point edge over Pacquiao in September, but Pacquiao climbed past him by five points in October. Three fewer voters participated in the voting in October than did in September and that appeared to help Pacquiao. Pacquiao received 13 of the 25 first-place votes from the elite panel of boxing writers, with Mayweather picking up the other first-place 12 votes. The difference turned out to be that all of those who did not vote for Pacquiao as No. 1 had him as No. 2. However, Mayweather had nine second-place votes, two third-place votes and one fourth. That dropped him from the top spot and into second place. Bernard Hopkins, who last fought on Oct. 18, 2008, when he routed Kelly Pavlik in Atlantic City, N.J., also tumbled. Though Hopkins hasn’t fought in more than a year, he was ruled eligible to be voted upon since he has a Dec. 2 fight scheduled against Enrique Ornelas. But some voters expressed disappointment with Hopkins’ choice of a tune-up opponent as well as his planned 2010 fight against Roy Jones Jr. and either dropped him totally from their top 10 or dropped him in the list. Hopkins, who was in a tie with Shane Mosley for fourth in September, is now seventh. The other change in the rankings saw Juan Manuel Lopez, who had been No. 9, falling out of the top 10 despite a decision victory over Rogers Mtgawa on Oct. 10. Lopez struggled down the stretch and had to hang on in the final round to win. Voters opted to dump him because of that and put in former middleweight champion Arthur Abraham in ninth place. Abraham knocked out Jermain Taylor in the 12th round of their opening round match in the Super Six tournament on Oct. 17.